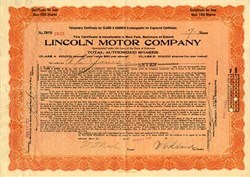 Beautifully engraved certificate from the Lincoln Motor Company issued no later than 1921. This historic document was printed by the American Banknote Company and has an ornate border around it. This item is hand signed by the company’s vice-president (Wilfred Leland ) and treasurer (William T. Nash ) and is over 91 years old. Lincoln Motor Car Company was founded by Henry Leland in 1917. He had previously created Cadillac and subsequently sold it to General Motors. After Leland had a dispute with the founder of GM, William C. Durant, he left Cadillac in 1917 along with many of his workers to form Lincoln. The first product of the Lincoln Motor Company were Liberty Airplane engines in 1917. The $6.5 Million offering sold out within hours. Unfortunately for Leland, the war ended shortly thereafter and the company lost its contract for the Liberty Airplane engines. The importance of quality had Lincoln run every engine that came out of the factory on a dynamometer for five hours, then have it disassembled, examined, put together and tested again before it was sold on a L-Series chassis. Lincoln Motor Company was known for its quality since Leland was responsible for Cadillac’s reputation. The first Lincoln cars didn't meet expectations. Only 3,407 cars sold in 1920 of the 6,000 planned. Lincoln owed a large tax bill so it had to go for sale. Ford bought it for 8 million dollars, the only offer, in February of 1922. It was a bargain price. Leland tried to buy the company back a few months later for the same price plus interest, to which Henry Ford replied: "Mr. Leland, I wouldn’t sell the Lincoln plant for five hundred million dollars." In 1922 Ford asked Wilfred Leland to leave and Henry Leland resigned as well. 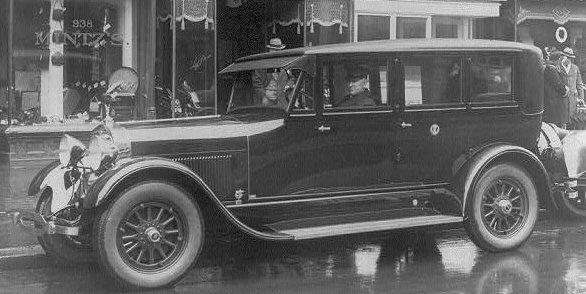 Lincoln offered 33 body styles in 1928. In 1933 prices crashed. The Lincoln Sedan went down to $3200 while its competitors Packard and Pierce-Arrow went down to $3860 and $2975 respectively. A cheaper car had to be made for the brands to survive. Lincoln and Packard had a cheaper car for 1936, but Pierce-Arrow lacked cash flow and was unable to develop a smaller car. Consequently, Pierce-Arrow closed down in 1938. Packard would close down in 1956, and Lincoln lives to this day, as the second best sold luxury car in America, trailing closely after Cadillac.